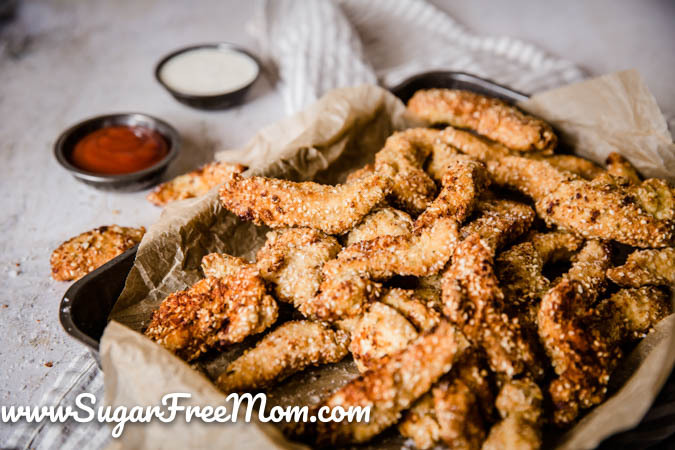 These Keto Sesame Chicken Fingers are perfect finger food for any party! 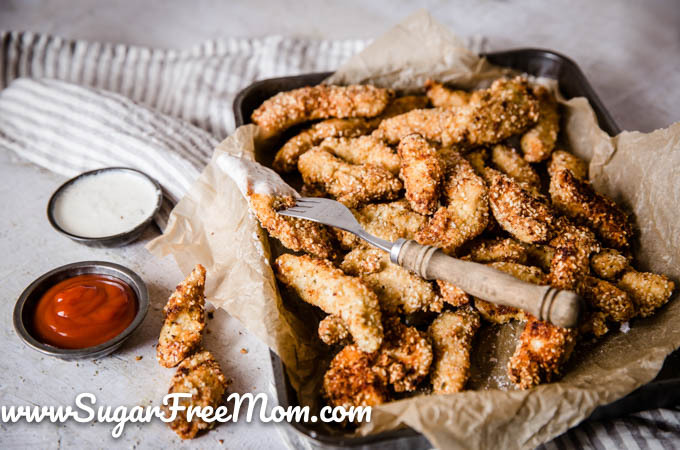 They’re gluten free, grain free, low carb and Nut Free making them one of the best allergy friendly entrees. Is there anything better than a crispy chicken tender? I think knowing they are actually good for you and made with your health in mind, makes them even tastier, in my opinion. 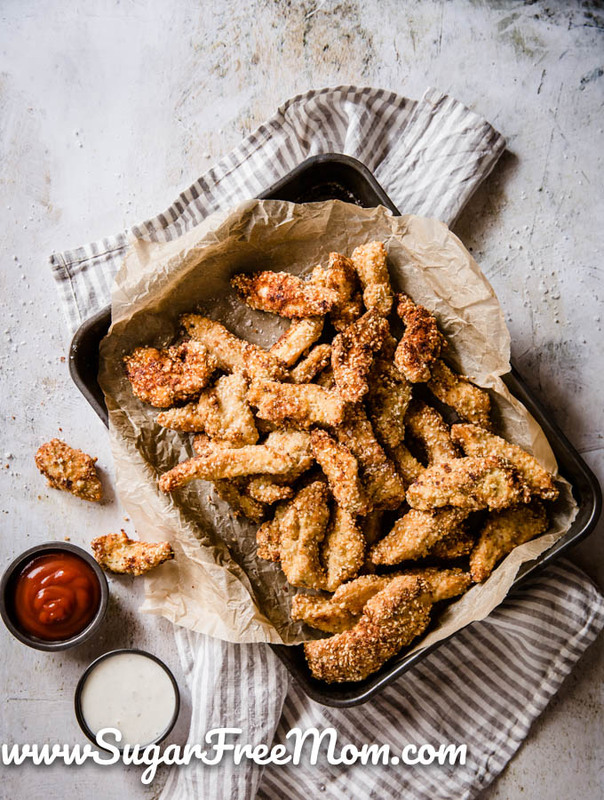 These Crispy Chicken Tenders are finger food at it’s finest. 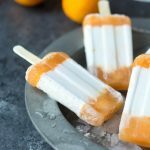 Kids will love them and not even realize they are keto and low carb friendly. 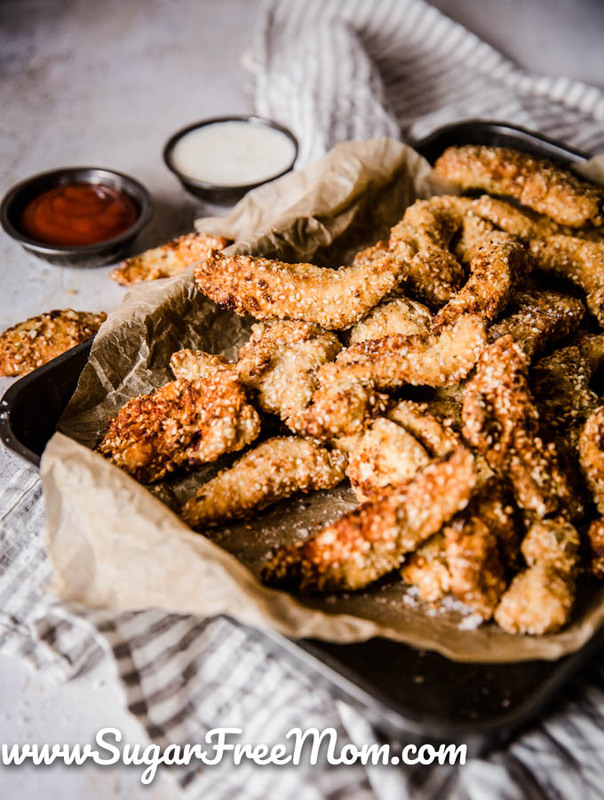 Crispy and crunchy on the outside and juicy and tender on the inside. You can enjoy these with just a side of mayonnaise if you like. I prefer the Avocado Mayonnaise from Primal Kitchen as it doesn’t contain soybean oil. My kids prefer Ranch dressing to dip, but my Homemade Ketchup recipe is a winner as well. You can use any fat you like to fry. Avocado oil would be my first choice, but ghee or coconut oil would work as well. Bacon or duck fat would also be amazing to fry these in. In case you haven’t noticed I’ve had a little help around here lately with recipe development. 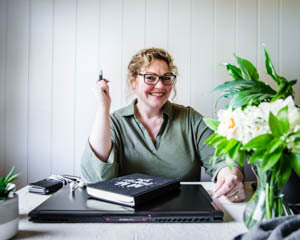 I’m working on a cookbook, though I can’t give you any details about that just yet, I am working diligently to get it complete by my deadline. 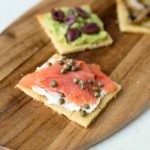 With that being said, I’ve added a few recipe developers to my team and todays recipe is by Naomi Sherman, from Food Creative. 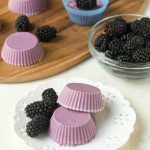 I’ve loved all the recipes she’s shared thus far and I hope you’ve liked them as well. Her Custard Tarts and Creamy Chicken soup look amazing, but these Chocolate Hazelnut Cookies are to die for! 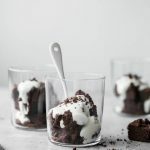 If you’re planning on watching the Super Bowl this weekend, this would be a great recipe to make since it caters to those with nut allergies. 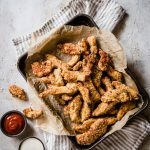 Whether you make it for a weekend party or just any weeknight, I doubt anyone in the family will complain when you serve them these crispy chicken tenders! Cut the chicken breasts into strips or bite sized pieces. Combine the sesame flour, sesame seeds and herbs in a large mixing bowl. Combine the egg and coconut milk in a second bowl and whisk to combine well. One at a time, dip your chicken into the egg mixture and then dredge through the sesame mix, making sure that the chicken is well covered. Place aside on a plate and repeat until all of the chicken is coated. Heat your oil or fat in a frying pan to about a depth of 1 cm, you want to shallow fry the chicken, not completely submerge it. Heat to a good frying temp and then start cooking the chicken in batches until golden brown and crispy. Drain on a paper towel until all of the chicken is cooked. was happy reading the ingredients till I read the instructions. EGG makes it not allergy friendly! Not able to find sesame flour. 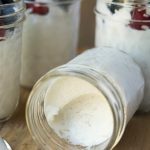 Can you make your own in food processor? Yes you could grind it in a coffee grinder or food processor, but be careful with it in the food processor as going too long it will become tahini(sesame butter). I enjoy reading you site, but I live on a VERY tight shopping budget and the healthiest groceries in Australia are the most expensive. I have found most of the special keto friendly ingredients (almond flour/milk, sesame flour, nuts etc) don’t fit the budget. 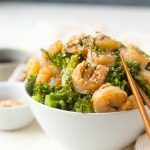 I am sure their must be a budget friendly way to follow the keto diet lifestyle, but how? Any suggestion are very welcome! Just eating real whole food, meats and vegetables without getting too fancy on special recipes should fit a tight budget.